Q. I have a 25×25 foot listening room with a high-end sound system. I have had my system for many years and would like to upgrade to get better sound. I currently have Avant Garde RX20 speakers and the amplifier (a Simaudio Moon model with a separate preamplifier) is only 100 watts per channel. Is it possible to upgrade everything and improve the sound quality without spending over $10,000? A. You have fantastic high-end electronics and there is no need to replace them. The place where you will make the difference is the speakers. With most speakers I would recommend more than 100 watts per channel for a high-end system in a large room, but making smart speaker choices will reduce your need for amplifier power. One way to get the most out of your amplifier is to get high efficiency speakers that make the most out of every watt. Another is to get speakers with built-in powered subwoofers to handle the bass. It is the bass that requires the most power from the amplifier, and when the subwoofer has its own power, the 100 watts from your amplifier will be devoted exclusively to the midrange and treble. In this case 100 watts will be more than enough even for very high volume levels in your large room. I have an ideal recommendation for you. I have long been a fan of GoldenEar Technology speakers and soundbars, and in 2012 I wrote about how the $1,000/pair GoldenEar Aon 3 bookshelf speakers sounded notably better than some $28,000/pair towers that were being demonstrated across the hall at the Consumer Electronics Show that year. I was so impressed that I ordered a pair of Aon 3s before I left the GoldenEar demo room. Though I did not need another pair of bookshelf speakers, I HAD to have them. 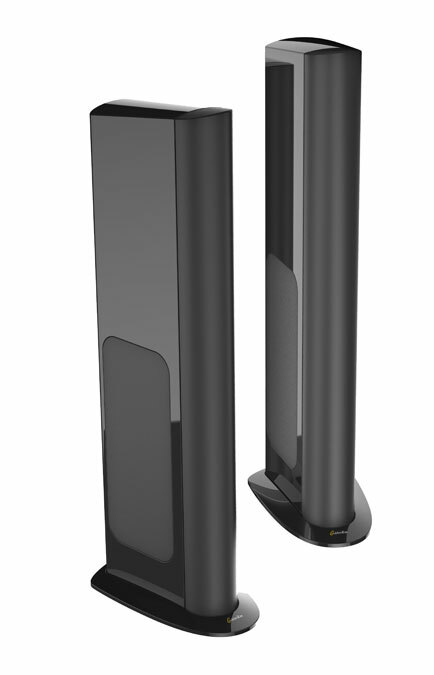 GoldenEar’s Triton Tower speakers have played to similarly enthusiastic reviews. The flagship GoldenEar model, the $8,498/pair Triton Reference, has been compared favorably with speakers costing up to $100,000 per pair. The Triton Reference has a 1,800 watt/channel subwoofer built in to each speaker and is extremely efficient, so it will make the most out of your 100 watt amplifier. Some listeners use tube amps rated as low as 15 watts with them! You can get much of the Triton Reference goodness in GoldenEar’s less expensive towers. The newly introduced $5,998/pair Triton One.R takes what GoldenEar learned in making the Triton Reference and brings it to a slightly smaller, less expensive package. The One.R towers have a 1,600 watt subwoofer built in to each speaker. The $3,498/pair Triton Two+ has been compared to speakers costing $50,000/pair and includes a 1,200 watt subwoofer in each speaker. I think even the Triton Two will provide a spectacular performance in your large listening room as the bass can shake the walls, the midrange is tonally rich, the treble is beautiful and airy, and the entire musical performance is seamlessly put together. Many of you are probably wondering how speakers selling for under $10,000/pair can be compared favorably to speakers costing in the tens of thousands. It is a reflection of the goodness of GoldenEar sound and value, as well as the over-hyped, over-priced nature of the majority of the high-end audio marketplace. Most of the very best audio gear is far from the most expensive, and I make it my mission to help all of you find it.